What used to be a theater prop once is now one of the most sophisticated heating appliances available. We are referring to the best electric fireplaces on the market and our crew will take you on a very fun and productive journey today. Our guess is that you are leaning to the latter and that’s why we will educate you on how to pick the finest electric fireplace out there. See our top picks and read the tips we have prepared for you below. Quick decisions are never a good idea. So let’s get cracking! DIMENSIONS : 18 x 43 x 55"
DIMENSIONS : 60 x 19.2 x 4.6"
DIMENSIONS : 50.4 x 5.5 x 21.6"
DIMENSIONS : 25.5 x 21 x 13"
DIMENSIONS : 100 x 5 x 21.5"
If you are prepared to unleash the power of your wallet, then you will get perhaps the most realistic and overall best electric fireplace out there. 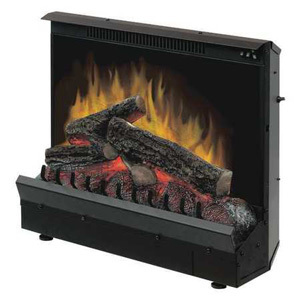 The MagikFlame Electric Fireplace is constructed in the Victorian style and will actually give you real logs. Alright, not real but they are holographic and this is a feature which is completely unmatched by other brands. You not only get 3D burning wood but you also get Bluetooth connectivity allowing you to control your electric fireplace from a distance. There are 21 samples of flames for you to choose from. Wait, there’s more realism to it. The crackling sounds that the unit makes are actually recorded from real burning logs. In terms of heat, you will be able to enjoy 4 600 BTU in ambient mode. You get to control the fireplace from the touch screen panel. You will also be happy to find out that the mantel is actually made of birch. If you feel like walking to the unit, you can also use the LCD touch screen for control. The maximum temperature is 88 degrees. The unit we are about to review can actually only wall-mounted. You got 4 options when it comes to the color and material of the body. They are Ivory, Mirror, Onyx, and Stainless Steel. This is also the order from cheapest to priciest. The cosmetics of this 50-inch unit are truly impressive as you get 5 levels of flame brightness. In addition to the visual realism, you get nice warmth coming from the top of the heater. So if you want to have a TV over the fireplace, you will need to have at least 24 inches of clearance. A slight drawback is the absence of a thermostat but since there are only a high and a low heat settings, this isn’t so bad. Besides, you can set the timer from anywhere between 30 minutes to 7.5 hours. It must be hardwired to a 120V circuit, comes with a remote and you can turn on just the visuals without any heat as well. Most fireplace inserts can be quite deep but this isn’t the case with the Dimplex DFI2309 Electric Fireplace Insert. It is only about 10.5 inches thick and will fit nicely. The fact that the unit does not have a glass and the decorative logs just stay there in 3D give you just a very pleasant, realistic feeling. The built-in forced heater is your main source of heat distribution in the room. The maximum power output of the heater is 1500W on high and 935W on low. It can only be hardwired or plugged into a 120V circuit. You will require an adapter in case you want to use a 220V circuit. Choose between 3 options – low heat, full heat, and flames only. You shouldn’t get your hopes up for this unit to heat your whole house. 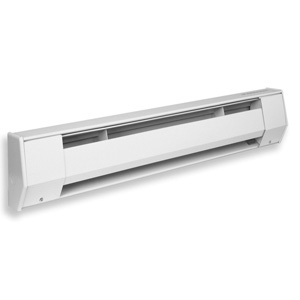 Use it for comfort, aesthetics and just a secondary heating option. No thermostat is featured in this unit as well. 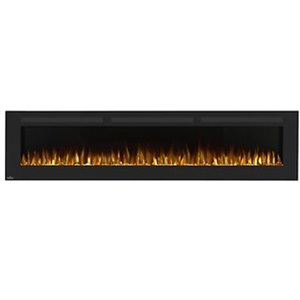 Any size of a room is great for the Napoleon NEFL Electric Fireplace. That’s because you get to select between not 2, not 3 but between 6 different lengths. They range from 32 inches to 100 inches. The price difference between the shortest and the longest model, however, is fivefold. 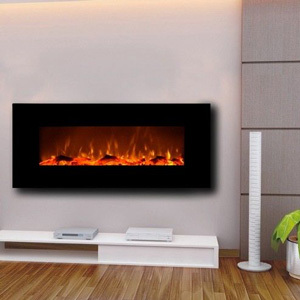 This electric fireplace is best wall-mounted and not wall-recessed because of the ultra slim design which it features. Well, you can still drill a hole in the wall and recess it but that’s pointless. Don’t worry about the power cord being visible as it can be painted over. At 1500W of power output, you get 5 000 BTU. The remote control simply looks smooth and it might be by far the most beautiful remote you will see today. The LED lights are high-intensity ones and you can have either blue or orange flames inside that fireplace. The mounting bracket is included. DIMENSIONS : 5.5 x 100 x 21.5"
DIMENSIONS : 46.6 x 10.2 x 23.4"
DIMENSIONS : 47.4 x 9.5 x 41.9"
DIMENSIONS : 67 x 18 x 30.5"
DIMENSIONS : 60 x 12.8 x 4.9"
This is another product which allows you to select a size. Choose between 7 great lengths but think about the money as well. There are also vents on the front to aid the two heat settings which you have at your disposal. 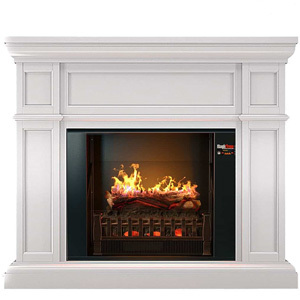 The Touchstone Sideline Electric Fireplace is designed to be recessed. You will see that there are little inlets on the back for a wall-mount. It’s just that the wall mount does not come with the heater – you need to purchase it separately. A big advantage, however, is the presence of a blower. The remote controls this functions along with the timer, power on/off, and flame height. This last feature is a convenient one as it can really add to the atmosphere. Flames can also be orange, blue, or blue-orange. Another option is to have the fireplace hardwired. The timer can be set to anywhere between 30 minutes and 7 hours. 400 square feet is the maximum space you will able to heat. You got not 1, not 2, but 3 possible ways of mounting this electric fireplace. 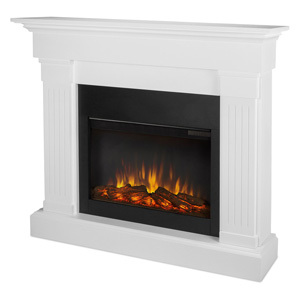 The ClassicFlame Felicity Infrared Fireplace can be wall-mounted, recessed or freestanding. IT comes in two sizes – 36-inch and a 47-inch variety. The flame effect can still be visible even without heat. But if you want heat, you can get 5 200 BTU which should be good for about 1000 square feet of space. This is because you get a combination of infrared heating + a fan. You will be somewhat limited by the length of the power cord though. It is just 3 feet long. But what will make your life easier is the fact that all mounting supplies come with the unit. 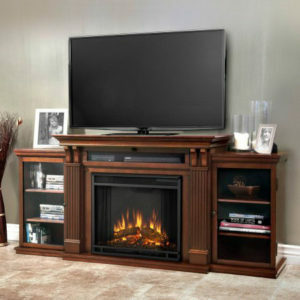 TVs can easily be installed about the fireplace because the fan is located in the front. Choose between the 5 flame color options and combine them with the uplights and the sidelights for maximum effect. There’s also a thermostat, a timer, and a remote. In case you want for a Victorian looking electric fireplace, this will be an excellent choice. The mantel of the fireplace resembles clean column capitals which are made of veneered MDF construction and solid wood. This body will never get too hot so that it can be freely touched even when operational. Additionally, a TV can also sit right on the mantel without any dangers. The fan will not make a lot of noise but will provide you with some decent amount of heat. 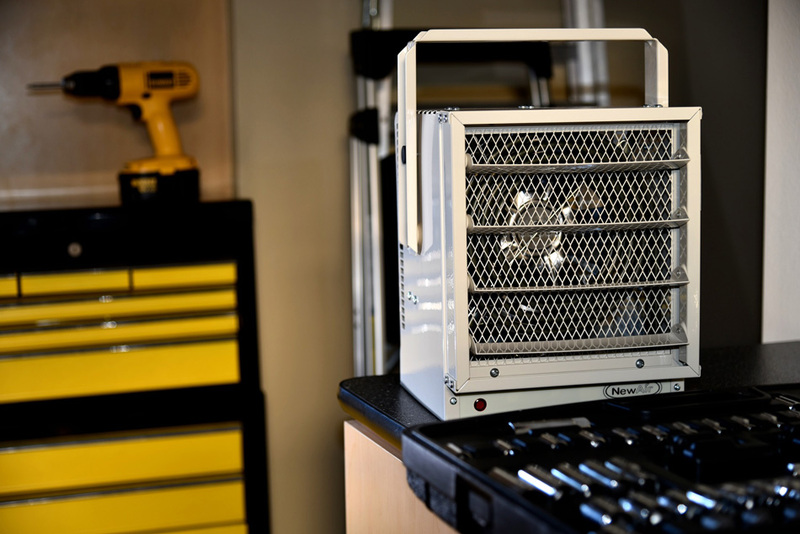 The 1400W or power output are enough to warm an area of about 400 square feet. No hardwiring is needed- just a regular socket. The remote is a nice addition although the control panel of the fireplace is not hard to operate. It is also barely visible – just 4 buttons in the top right corner. As a minus, we can mention the fact that you will need to assemble the unit from scratch upon purchasing it. Interestingly enough, the manufacturer actually labels this product as an “entertainment unit”. This isn’t because it will play with your children but because this is basically a TV stand and a cabinet. At a medium to high price, you get a nice piece of furniture and not just a heater. The whole veneered MDF construction weighs at about 144 lb. but it also has 3 flat surfaces for you to put things on. There is also a cabinet on each side – both with glass doors. The electric fireplace must be hardwired as it doesn’t have a plug. The firebox also has a screen which sort of adds to the feeling. The craftsmanship is really nice as even though the unit will emit heat, it will not endanger your TV. The maximum output is 1400W giving you about 4 700 BTU. Be sure to note that you will need to assemble the whole construction yourself. What this electric fireplace lacks in perks and functionality, it completely makes up by having 9 changeable flame colors. This gives you full customization and control on how your fireplace looks. It can be wall-mounted or…well, it can also just stand there. 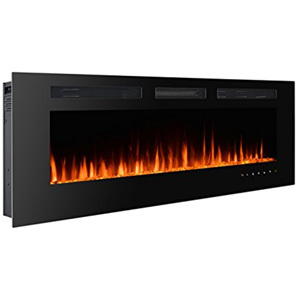 Yep, the GMHome Electric Fireplace can also be a freestanding one and this is a big reason why it made our list today. It comes with both a wall-mounting bracket as well as feet. Having to assemble the whole thing yourself is pretty much the only drawback. You got two ways of controlling the unit. Do it manually through the LED display or use the remote. If you keep the heater at the lower setting, the output would be 750W. The higher setting works at 1500W. Temperature generally isn’t an issue as you will be able to get 82 degrees at maximum. The timer can be set to anything between 1 and 8 hours. In case you have already checked our work on *the most popular heating and cooling systems on the market* (anchor to the home page), you probably already know what makes a good electric heater. In that sense, we will perhaps only waste time if we go on talking about the best features an electric fireplace should have. Also, taking a look only at electric fireplace reviews consumer reports might not be enough. In order to help you make the right decision, we think that coming up with an outline regarding most, if not all, fireplace types is the most appropriate thing. In this section below you will see important information on a number of fireplaces regardless of what powers and what fuels them. There’s a wide range of choices and they are all unique in a way. In the end, we will see exactly why we think that electric fireplaces are the way to go. We might even give you a bonus section about the sub-types that electric fireplaces have. We’ll see how it goes – so let’s move on. So if we have a traditional fireplace, burning real wood, chimney going up through the roof, the whole nine yards, we need to keep these things in mind. Little efficiency – unfortunately, in this case, we will get about 15% of efficiency tops. And this is exceptionally low compared to utilizing electricity or a boiler or anything like that. The biggest downside is perhaps the fact that this big investment will result in heating only one room. There’s no heating of the house and it is all about ambiance. So basically your regular fireplace might be more of a burden than anything else. In order to have one, you will need to conduct a serious restructuring of your house or maybe plan a fireplace prior to building your home. Next, you have all the maintenance and safety considerations. You will need to properly clean the chimney, clean the firebox and take out the ash pan. There are also a number of supplies which you will need to purchase and have lying around. The fuel is… well, wood. While getting logs is not very expensive, you need to know that constantly supplying your fireplace with the appropriate amount can be quite tiring and at some point, you might get sick of it. All of this is fine and it might be worth it had you been able to heat up your whole home. At the end of the day, the 15% efficiency might not be a good enough reason to have a full-scale fireplace. There is a way to use your real chimney and everything needed by a regular fireplace but without the actual fireplace. We’ll have that next. The gas log system will allow you to have a real fire but not a real log. The piece of wood lying in there is actually ceramic. The gas burner is right below it. This an artificial fireplace which uses propane for fuel. On the upside, the ceramic log will get heated and will remain warm after the fire has been turned off. Another advantage is that you basically get a realistically looking fireplace but without the need to clean it, take care of the ash, or scrape the chimney. It will still be woefully inefficient, though. The whole heating mechanics do not change – they stay the same. You got flame in a box in your wall and that’s it. The 15% efficiency rating stays. Who cares that you won’t need to clean a lot after it? The gas insert is way more sophisticated and efficient on the other hand. If you are lucky, you might actually stumble upon the **best gas fireplace insert of 2019**. It is basically a hotbox or a firebox which slides in your existing opening in the wall. It doesn’t use pipes or chimneys – only two liners which will go up the chimney. Don’t worry, no soot will be generated through the use of such a device. It is basically *a good propane heater and as such it does have a number of benefits* (anchor to the propane heaters page). The best part is how this type of fireplace works. Its glass door is sealed meaning that no oxygen from the room is taken. The first line of the two takes fresh air from outside and runs it inside the firebox. The second line is the vent line and it goes outside of the house. Thanks to the ceramic glass you also get radiant heat. The efficiency here is through the room – 70%-80%. Now in case you do not have an opening in the wall, you can still have a gas fireplace. That’s the zero-clearance gas fireplace. It can be built-into the room. The presence of masonry or a chimney is not a prerequisite in order to have such a unit. The best products of that type come with a beautiful mantel and molding. The thing is that such a construction is, in fact, flat so you only need to make sure you do not select anything which looks cheap or doesn’t blend in. These freestanding units are *your typical wood burning stoves with piping, cast iron doors, ash pans* (anchor to the wood burning stoves text) etc. They are like any regular fireplace with the exception that they aren’t built-in anywhere. These units require a hard floor such as tiles although it can also be hardwood. The only requirement is that it isn’t anything combustible. Freestanding wood burning stoves aren’t a bad option because you do not need to build anything to have them. You run some type of a flue system and you are good to go. On the downside, they got all the cleaning needs that a regular fireplace has but there are also a ton of safety precautions to be kept in mind here. Since the stove isn’t built-in, people need to be exceptionally careful when moving around it or when playing with their children and pets. You also want to have a lot of clear space of at least 3 feet around them with no pillows, toys, electronics, and so on. They are pretty efficient, though – again 70% to 80%. 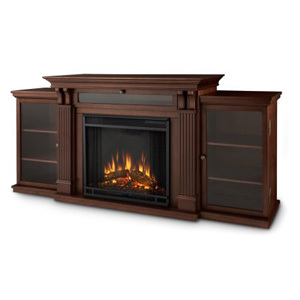 There is one more freestanding fireplace unit which is worth mentioning real quickly. The pellet stove is a good alternative to people looking to replace their **wood burning stoves**. The fuel is basically compressed sawdust. The unit also uses electricity so that the combustion blower can work. This appliance is an interesting heating option because it is a stove using hard fuel but it is a convection heating appliance. The power vent system gets rid of the harmful fumes while thanks to the convection, all the heat remains in the room. On the negative, you need to constantly feed the heater some sawdust but you can control the temperature with your feed rate. Ah, here we are. Finally, we get to talk about the characteristics of the most realistic electric fireplace. No venting is needed here and that is just a huge benefit. You simply plug your unit to an existing outlet or have it hardwired and voila! You get heat and visual pleasure. Any of these products regardless whether we talk about a freestanding fireplace, can become a piece of furniture to your home. You don’t get that with other fireplaces. These are perfect for your office, small apartment or condo. Heck, even if you are a renter, you can just unplug it and take it away with you. 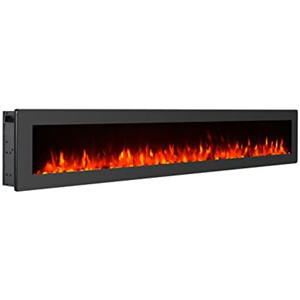 The convenience factors are off the charts and you don’t even need to see the best 2019 electric fireplace reviews to know it. The latter is becoming more and more popular because they don’t warm up the air but the objects instead. Don’t miss out on checking some of the infrared electric fireplace reviews if you have the chance. The shortest way to conclude this section would be to say that an electric fireplace is way closer to the *most elegant space heaters out there* (anchor to the space heaters text) instead to a regular fireplace. Well, it is a space heater but with great looks. And that’s what really counts. Do you want blue flames on your wall? You got it! It is clear that the winners of the research above are the electric and gas fireplaces. In order to draw a line between them, we aren’t just going to compare them but we will do so in the form of a Q & A section. This way it will be way easier to grasp all the pros and cons of electric fireplaces. 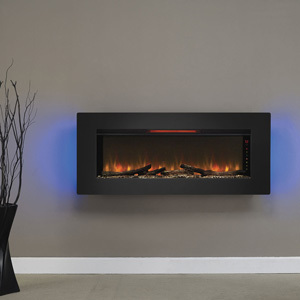 Q: Are electric fireplaces purely for aesthetics? A: No, they generate heat which is enough to heat up an area of about 400 square feet. They are an excellent secondary heating option. Ambient heat is their main upside. Q: Since it emits heat, can I put or hang a TV above such an electric fireplace? A: Yes, simply make sure that the unit you select radiates heater from the bottom or the front side. You don’t want any warmth going up. Gas fireplaces require some clear area around them for safety measures. Q: Will the unit or the glass in the front become too hot for people to touch it? A: No, there is nothing burning and the glass never gets hot. Children can touch it and they won’t get burned. When it comes to propane fireplaces, you don’t want anyone touching the surface. Q: But isn’t electricity the more expensive option in this case? A: It isn’t. It will cost you about 17-18 cents per hour to use the heating from an electric fireplace. Annually that’s about 80$. Gas heaters will set you back at least 300$ each year. Are you still asking yourself whether electric fireplaces are efficient or not? The simplest units among these are the freestanding electric fireplaces. There’s nothing to consider in terms of the installation here. There’s no method – it’s just a piece of furniture for your room. Put it wherever you see fit. Hint: make sure there’s an outlet nearby. 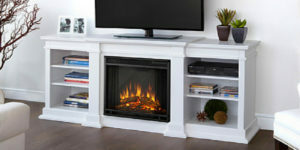 The next simplest unit to install is the wall mounted electric fireplace. The best part is that these typically come with a bracket included in the set. You only need to pick a spot on the wall and drill a few holes. Now, had had you have to buy the bracket separately, that would have generated a problem. Typical fireplaces can be converted to electric ones. You just need to get the right unit and that’s called an electric fireplace insert. It will fit right in the opening of your old fireplace if you know how exactly to install it. There’s typically some casing and a mantel with it. The only thing left to do is the wiring part. Speaking of wiring, the most challenging electric fireplace to install is the wall recessed unit. It will require a cutout in the wall. You need to be careful not to hit any power cords as you cut. Additionally, these units are typically hardwired and it’s best if you get a certified electrician to do it for you. This is the final section of our guide to getting the best electric fireplace available. 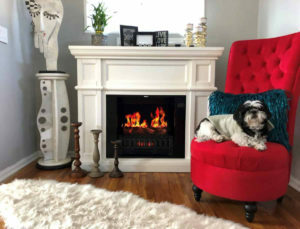 Our sincere hope is that we have definitely helped you understand all the differences between the various types of fireplaces. Learning about the full spectrum of these units will surely aid you in your decision-making process. If you liked what you read, please comment the article and share it with friends or complete strangers if you see fit. Send us a message if you think we can improve something in the piece above. Don’t forget to ask us any questions and as always – stay put!